As CBO for Frontage Laboratories, Dr Davis oversees all aspects of business development, sales, marketing, strategic partnerships and alliances. Hugh has over 30 years of experience in the pharmaceutical industry in R&D. 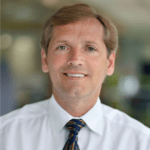 His most recent position was with Johnson & Johnson (NJ, USA) where he served as VP and Head of Biologics Development Sciences in the Janssen BioTherapeutics division of Janssen R&D, LLC since 2001. In this role, Hugh participated in the development and approval of many biologic therapies. Prior to J&J, Hugh led the Pharmacodynamics & Exploratory Research Laboratory in the Clinical Pharmacology Unit at GlaxoSmithKline (NJ, USA) from 1996 to 2001. Hugh has published over 75 manuscripts in refereed journals, book chapters and invited review articles in areas of therapeutic drug discovery, clinical pharmacology and development in immunology, oncology, metabolic disease, bone metabolism and cardiovascular medicine. He obtained his PhD from Villanova University (PA, USA) and completed his Post-doctoral Fellowship at Centocor, Inc. (PA, USA) where he patented the characterization of the CA 125 cancer antigen.